Paris-based Lebanese journalist and film critic Houda Ibrahim studied Theatre, Literature and Communication in Beirut and Paris. She has worked at the Agence France-Presse (AFP) and Radio Monte Carlo, where she served for nearly twenty years covering major Arab and international film events. 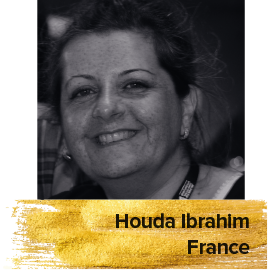 Houda is a member of the Selection Committee of the Biennale of Arab Cinema film festival in Paris. She has served on the jury of several film festivals. She has also been a jury member at the International Federation of Film Critics (FIPRESCI).